In its largest Compressed Natural Gas (CNG) bus delivery ever, Scania will supply 481 Euro 6 buses for the renewal of Bogotá’s TransMilenio Bus Rapid Transit system. Colombia’s capital city is replacing its earlier Euro 2 and Euro 3 diesel buses with the latest in low-emission technology. Scania’s Euro 6 gas buses represent a huge leap in cleaner technology compared with these older-generation buses but also in relation to the more recent Euro 5 emissions standards. In operations with the new Scania gas buses, carbon emissions will be up to 20 percent lower while emissions of particulate matter will be two to three times lower. Emissions of nitrogen oxide are four to five times lower than Euro 5. The bus network, originally established in the early 1990s, encompasses 12 lines totalling 112 kilometres, with 1.7 million passenger journeys every day. The public tender for the renewal programme has focused on six of the 12 lines and following the tendering process, the operator SI18 will now provide services for the three lines Suba, Calle 80 and Norte with 481 Scania buses. They will go into operation during the first half of 2019. The 179 articulated Scania K320 IA 6x/2, (320 hp engines), buses have a capacity for 160 passengers and the 302 bi-articulated Scania F340 HA 8×2 (340 hp engines) have a capacity for 250 passengers. All buses will be bodybuilt by Busscar. Gas Natural S.A. ESP (Gas Natural), a distributor and marketer of natural gas in Colombia, says the industry has the infrastructure, support, strength and experience to meet all the requirements in this new era of mass transportation in Bogotá. The company expressed its satisfaction with the major order for natural gas buses. Other sources in Bogotá note that the balance of tender decisions, of which the total offer was more than 1,100 vehicles, focused on the purchase of Euro V diesel buses, no longer for sale in Europe. A Council spokesperson lamented the lost opportunity for the city to make a real statement by replacing diesel buses entirely with natural gas. Nevertheless, John Jairo Contreras, commercial director of Gas Natural, noted the CNG outcome was a collective achievement that involved gas chain operators, District Administration, TransMilenio, CNG operators, environmentalists, experts and more. Together, they raised awareness of the need for cleaner fuels and vehicles. They noted the utilization of natural gas has a real and significant impact in the reduction of particulate matter and oxides of nitrogen, the pollutants that most affect the health of the citizens of Bogotá and, likewise, the reduction of carbon dioxide (CO2) causing climate change. Noise from the buses is also majorly reduced. 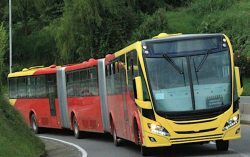 The President of the drivers union highlighted that in the country “there are already around 700 dedicated natural gas buses in operation, and this tender will continue to grow the number of clean buses.” In this sense, cities such as Medellín, Cartagena, Manizales and Palmira have also opted for the change from diesel fuel to natural gas for public transport.